I was extremely nervous about the first scan with Baby #3. Just a few weeks ago I was back and forth in the doctors to have some blood tests to check my hormone levels because of certain pains. So I was eager to have my scan and was hoping to get a scan appointment before Christmas but the Midwife said there are so many people due around July, it might take a while. After nearly two weeks of waiting I finally had my scan appointment letter and my first scan was for Wednesday, 30th December 2015 at 11.20am. Luckily, my partner was able to take time off work. It was still the school holidays so we arranged Elliw to go to my partners Mothers and Mia to go to my Dad's so we could go for the scan. Once we dropped the kids off we managed to get a space in the busiest car park ever. I ran into the hospital because the rain was pretty heavy. We arrived at the hospital about 35 minutes early. The letter had said I needed to drink a pint of juice/water, anything but milk and fizzy drinks. Silly me had drank a pint of diluted juice with my breakfast and then again an hour before the scan. So of course, I was absoloutely bursting. Because we were early, my partner wanted to go to the café to get a coffee. I felt so uncomfortable and nervous at the same time. We didn't wait long until my name was called to go into the room. I laid down and the woman put some of the gel on my stomach, which was actually really warm. She pressed down pretty hard below, the place that really pushed my bladder. I turned my head and there Baby was, wriggling about. In fact, Baby didn't stop wriggling. I was shocked seeing the littlest legs and arms moving about. Watching Baby wriggle, and seeing the heartbeat made it all real. I am actually going to have a baby I thought! I was over the moon. The lady was very friendly. After the scan finished, she told me to go to toilet before I burst and to wait in the waiting room whilst she prints a photo of Baby and sorts other paper work out. At the time of the scan Baby was only 10 weeks 3 days old. Which made sense because of all the negative pregnancy tests I had. They have given me another scan appointment date for January 18th. They want me to come back because they need Baby to be a certain size and Baby should be that size at around 12 weeks. At the time of the scan I should be 13 weeks (if dates haven't changed again). It's so lovely seeing them on the screen for the first time, wriggling around! Glad the first scan went well! And I am amazed you managed to get a parking space. That carpark is stupidly busy!! They should have special bays by the maternity ward so you don't have to waddle far with a full bladder - and bloody hell that was awful! !n Hope all goes well with your second scan! Congratulations! I am always so nervous at scans, I'm so pleased it went well for you! Congratulations! I was nervous for every one of my scans in the past. Very exciting! So exciting. 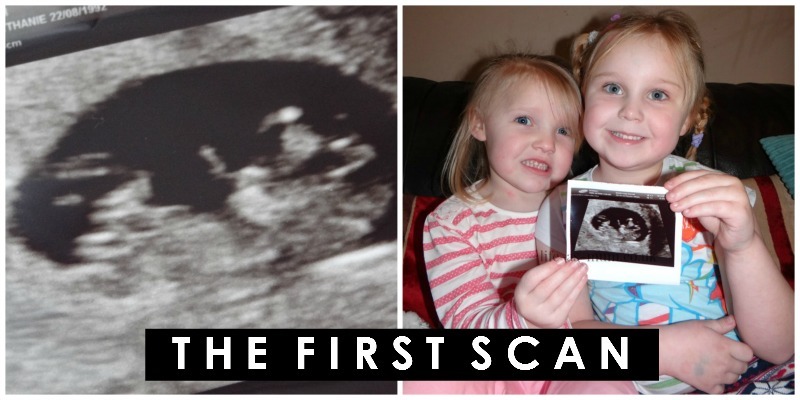 That first scan is such a combination of excitement, apprehension and emotion isn't it? Huge congratulations, that first scan is really terrifying isn't it. Lots of luck. Thanks for linking up with us for this first #sundaystars of 2016. Hope to see you next week.